How to Make Money with DMA Style of Trading? We will analyse the question of DMA which stands for day moving average from the analytical point of view that how it can be used to generate profit for you. First of all we will see that what is DMA and how it helps an average retail trader and how he use it to improve his bank balance. Daily fluctuation in prices makes analysis difficult, so traders look for patterns. They do so using moving averages. This is the mean price of a stock or index over a fixed period of time. They often prove very effective in tracking the trends of financial markets. There are a number of different types of moving averages that vary in the way they are calculated, but how each average is interpreted remains the same. The calculations only differ in regards to the weighting that they place on the price data, shifting from equal weighting of each price point to more weight being placed on recent data. The three most common types of moving averages are simple, linear and exponential and in terms of days are 200 DMA and 50 DMA. The 200-day MA will take the last 200 days worth of data and, you guessed it, average it out. The 50-day MA will only take the last 50 days and so on. 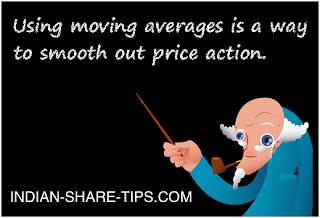 There are various kinds of moving averages. Of these, the most commonly quoted is the daily moving average. If you want to track the trend over, say, a period of 30 days, you monitor the 30-DMA. This will help you identify the short term bullish or bearish outlook by comparing the current trading price to the average. However, in situations such as these, volatility is high. So one day markets may fall 400 points, and rise 300 points the very next day. To counter these drastic fluctuations, analysts use the 200-DMA or the 200 day moving average. Since this average takes into account values over a longer term of 200 days, it eliminates short-term instabilities. So, if the value of a stock is falling, traders wait for it to reach a certain level called ‘support’ before buying. Similarly, if the price of a stock is rising, then it is better to wait until it reaches the higher point of a range called the ‘resistance’ level. How to Make Money from DMA? The critical question is to use the concept of DMA or day moving average is to make money and one can understand the importance from the fact that in US, there are 252 stock market trading days. As per our research we know that Dow Jones Industrial Average has mostly reverted in a year to its 252-day moving average each year. However, in 2013, it has yet to revert to the 252-day moving average or DMA. The only year this happened before was in 1989. Thus a high probability exists that US market may drop to its 252 DMA average from where it bounces and thus this dip down becomes the ideal opportunity to enter in the market and make a good amount of money. Just remember that Moving averages are used to identify current trends and trend reversals as well as to set up support and resistance levels. Moving averages do not predict price direction, but rather define the current direction with a lag. Shorter term moving averages like 5 or 15 DMA be used for short term trading and 50 DMA and 200 DMA be used for medium term to long term trading. All high quality stocks have a tendency to bounce back from 200 DMA in India which generally becomes a point where investors flock to buy the stock and provide necessary stock to the market. Nifty and Sensex equally finds support at 20 DMA followed by 50 DMA followed by 200 DMA and lastly at 52 week DMA. So as a strategy one can enter near the support and exit near the resistance and this strategy works best when index or stock is in a channel formation. Last but not least finding it difficult to fathom; than you can straightaway get the Genuine Stock tip of the day for intraday trading and make money.